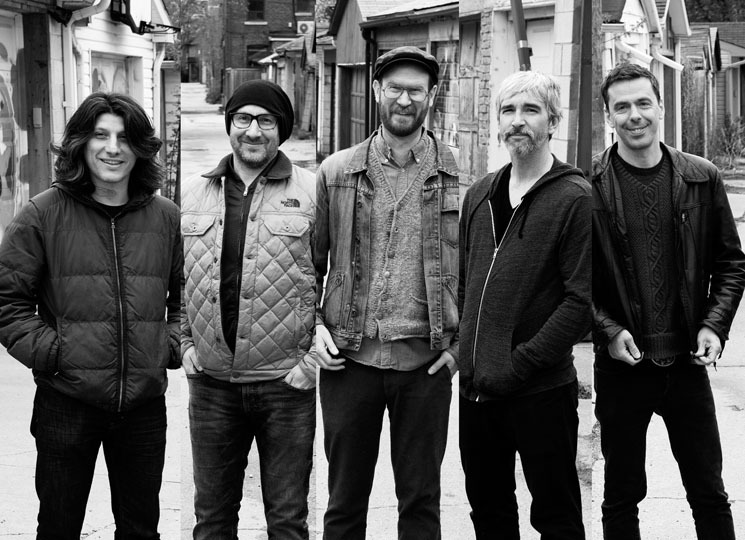 Over the course of two decades and six stellar albums, Toronto-based post-rockers Do Make Say Think have quietly ascended from the basement of U of T's radio station to international festival stages. Stubborn Persistent Illusions, their first release in eight years after an unofficial hiatus, is a captivating return to form that betrays a weary optimism in the face of personal and social anxiety. Comfortably established on Constellation Records' roster, the band have a patient chemistry that saturates their new LP, Stubborn Persistent Illusions. Multi-instrumentalist Justin Small describes how the album began to develop shortly after the band resumed performing again several years ago. "Charlie [Spearin] and Dave [Mitchell] would jam every once in a while and send out MP3s that eventually became genuine compositions," he says. "Everybody else started thinking, 'Well I'm kinda missing out, I better show up to these jams,'"
Working through a copy-and-paste compositional method and drawing inspiration from a Buddhist poem about living in harmony with a "wild mind," the band took a more narrative approach to the new record. "We really wanted to try and tackle a larger concept head on while we were writing, and it became difficult because we are creatures of habit," Small admits. "Often the music writes itself, and the process imparts wisdom on us." Without the convenience of lyrics to convey images and themes, the band rely on the intimate sonic vernacular they have spent a career honing. "I think a lot of instrumental bands, DMST included, try to find a voice that we can communicate [with] from our own experiences," Small says. "We're all getting older and our day-to-day worries are more compounded. We have children and get super stressed and have anxiety all the time." During the mixing process, the band were surprised at the realization that every song was written in a major key. "I guess it took the psychic communication of music to let everyone else in the band know that we're doing alright. Who knew?" When asked where the group fits into the Canadian musical landscape, Small's reaction is just short of coy: "I like to think that we would be mentioned in the history of Toronto independent music," he says. "We sort of fit as this" — he laughs — "cool older brother that went off to college and doesn't say much at Christmas dinner and always kinda has cool shoes, but is always kinda broke."